I immediately knew which book I would chose this year. From the moment this was available for pre-order, I have longed to own it and dive right in. When it arrived, I was knee deep in showing houses and in the middle of my big house clean out. Plus I had, once again, requested too many books to review for virtual book tours (at least I am consistent). The cover art is stunning. The story sounds intriguing. Who wouldn't want to meet a younger Marilla Cuthbert, see her romance with John Blythe unfold, and wonder if the reason she was so hard on Anne when she came to Green Gables was because she, too, once was a dreamer? While I've never read a book by McCoy, my hope is she will do the Marilla of Lucy Maud Montgomery's books justice as the story unfolds. Plucky and ambitious, Marilla Cuthbert is thirteen years old when her world is turned upside down. Her beloved mother has died in childbirth, and Marilla suddenly must bear the responsibilities of a farm wife: cooking, sewing, keeping house, and overseeing the day-to-day life of Green Gables with her brother, Matthew and father, Hugh. Emboldened by her aunt, Marilla dares to venture beyond the safety of Green Gables and discovers new friends and new opportunities. With her friend Rachel, she joins the Ladies Aid Society, she raises funds for an orphanage run by the Sisters of Charity in nearby Nova Scotia that secretly serves as a way station for runaway slaves from America. Her budding romance with John Blythe, the charming son of a neighbor, offers her a possibility of future happiness—Marilla is in no rush to trade one farm life for another. She soon finds herself caught up in the dangerous work of politics, and abolition—jeopardizing all she cherishes, including her bond with her dearest John Blythe. Now Marilla must face a reckoning between her dreams of making a difference in the wider world and the small-town reality of life at Green Gables. 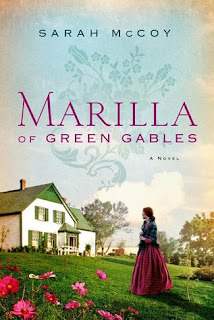 Purchase Marilla of Green Gables here! I remember loving the Anne of Green Gables books...and Avonlea is a place I would love to revisit. Thanks for sharing, and enjoy. What a lovely cover. Hope it gets your reading off to a great start in this New Year. Thanks for visiting. ladies. Stopped by your blogs. The books you chose sound fabulous. Hope you enjoy them.